Bye, bye 2018, welcome 2019! Another year ahead with plenty of great opportunities awaiting for us to invest to (or at least I hope so!). But before that, I better organise my ‘messy’ portfolio to see what has been delivered this year and what I am planning to do for 2019. 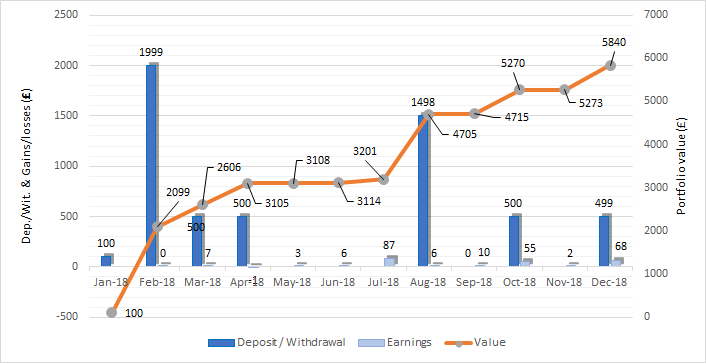 2018 has been a revolutionary year for me, I added a high percentage of my savings into my investment portfolio and battled the fear to be invested. I have no regrets so far after seeing the results. Algotechs, Vanguard and Grupeer are my three biggest money holders. By mid year, I decided that diversifying across multiple platforms would be beneficial to lower risks and improve my passive income. I started with Mintos and Crowdestate, at the same time in August, and Envestio and Fast Invest, a few months later. My main passive income streams are from P2P lending platforms, bond funds, rental income and index funds dividends. 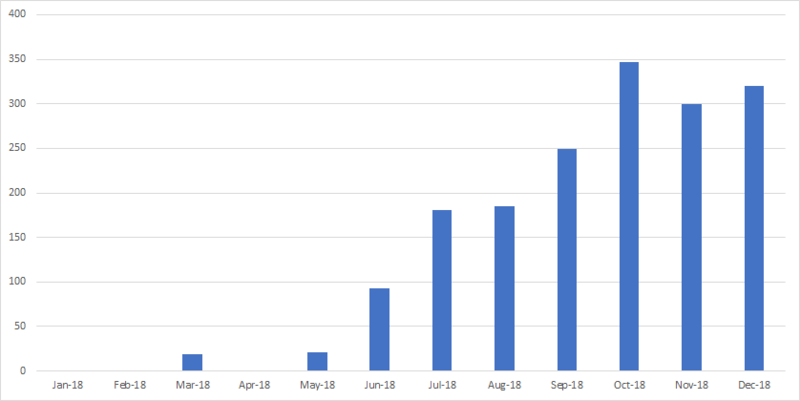 The chart is picking up momentum since I started investing with crowdfunding platforms back in February. 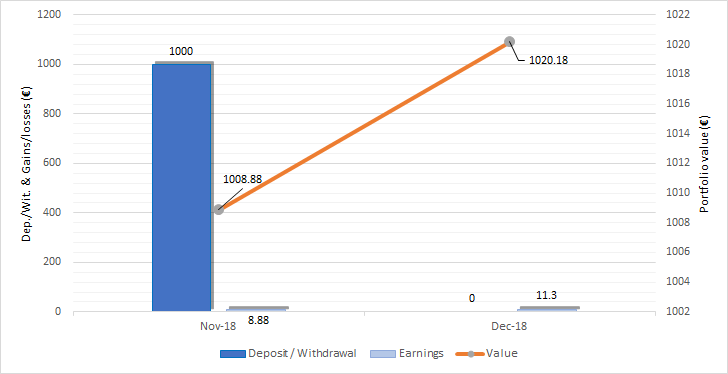 Only 4.4% of 2018 earnings are passive income, I would like to increase it by 10%, reaching an approximate value of 700€ per month by the end of 2019. 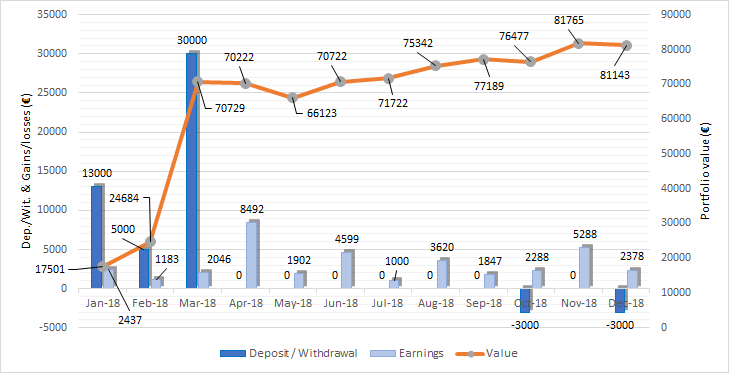 Not a bad month for Algotechs, returns are above 5% but below the 2018 monthly average of 7.5%. The EUR/USD exchange has been very volatile this year and this is exactly what this algotrading software likes (and explains the great returns). 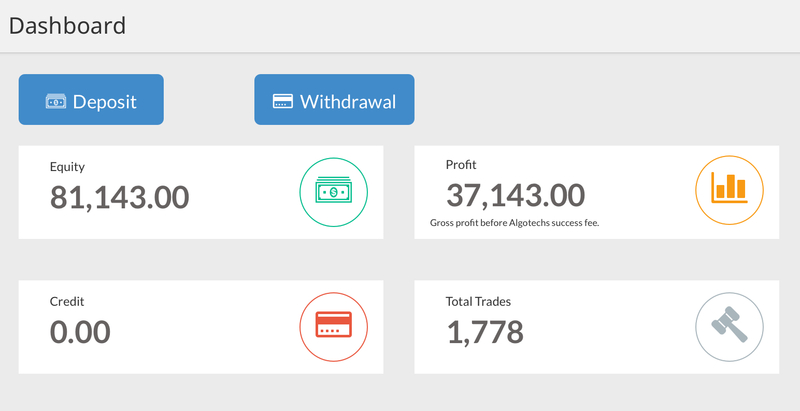 I withdrew 3000€ from my trading account, however, the funds are blocked in a Danish bank for the time being. The value declines 622€ compared to last month. 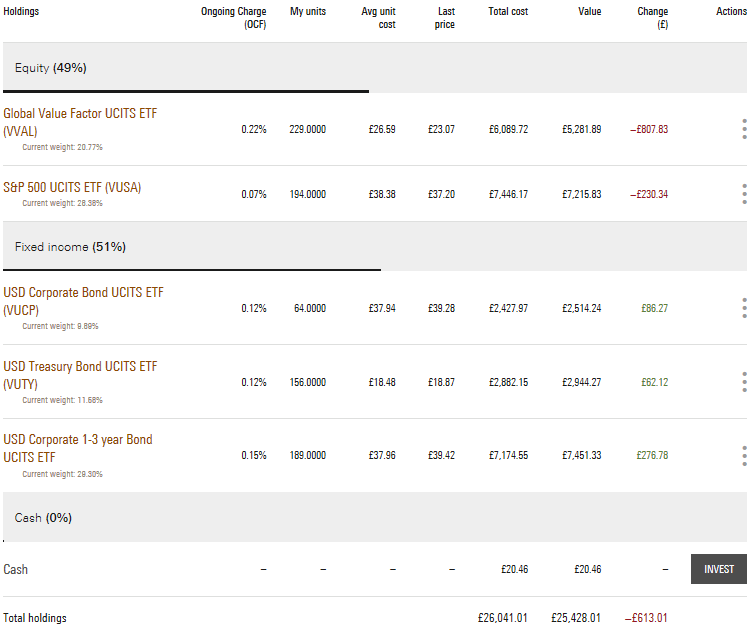 Stocks got hammered, and so did my Vanguard ISA account, dropping -1093£ in December. News that the Federal Reserve would continue its planned interest rate hikes, a government shutdown loomed and disappointing financial results spooked investors. 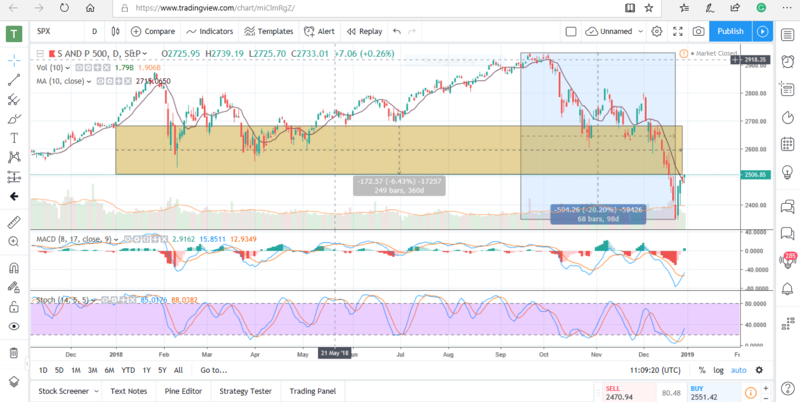 S&P 500 dropped up to -20% from its all-time high level and bounced back to recover a few points. The index drops -6.4% in 2018. Luckily for me, I follow a 50/50 portfolio policy, 50% bonds and 50% stocks, as Benjamin Graham recommends to defensive investors. 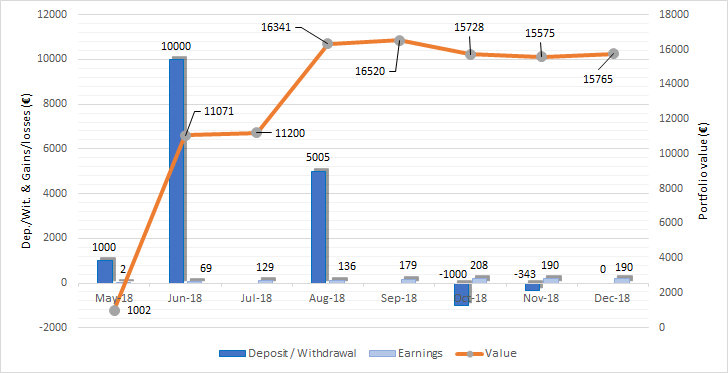 Therefore, my ISA beats the market and gains 0.04% for 2018. Thanks Graham! Global Value Factor UCITS ETF (VVAL) funds. December is the third best month for Property Partner since inception, +£68 into the pocket. I sold my shares of Golden Hill Fort, Isle of Wight at a 13% premium price with a total return of £19.41. I also deposited £499 to purchase shares of the new listing property opportunity posted a few days ago. It offers a 6.72% rental yield and the transaction fees are reduced by 50% until the 3th of January. I wrote my first review of Property Partner after one year of investing sharing my results and opinions here. 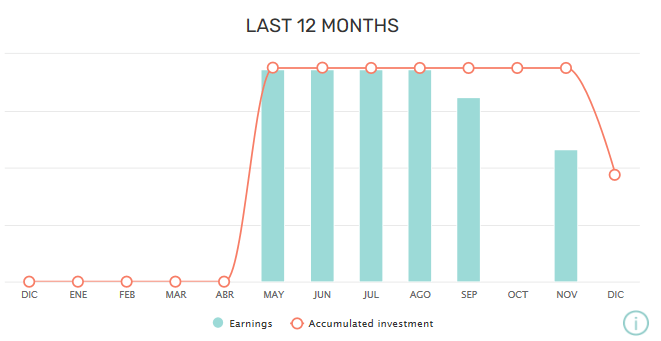 Average earnings this month for Housers, the Spanish real estate platform. The returns are generally lower because it automatically deducts taxes from income. Also, part of my funds are invested in what the platform calls buy-to-sell opportunities, which means I will get the returns once the properties have been sold. Some of these projects are near the end of term and I expect a rise in earning soon. I received delayed rental income from Estadio Nacional, as usual. 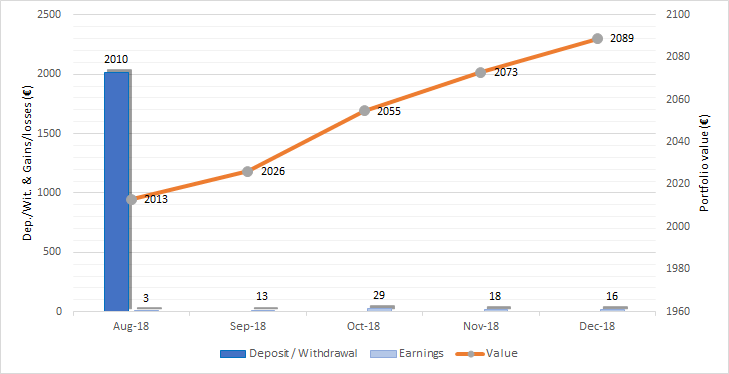 As a consequence, I am selling my shares in the marketplace, as I am neither happy with the payment delays nor the monthly rent agreed on the tenancy contract, making the current annual yield lower than the previously estimated. So far, 150 shares are sold and reinvested in the last two development loans, and 150 remain in the marketplace for selling. Housers is currently offering 25€ cash back after a minimum of 50€ first investment, if using this link (I get another 25€ too). 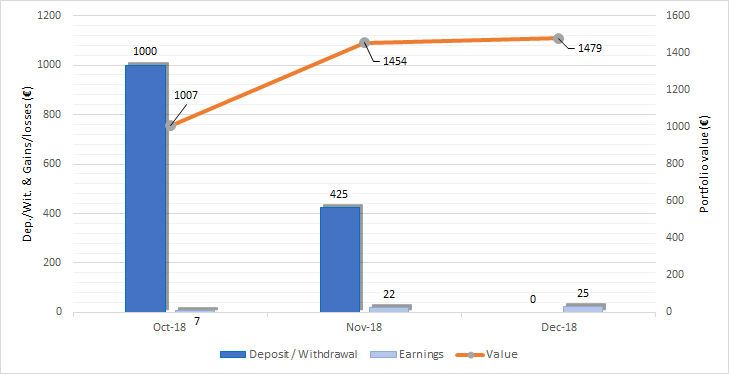 I plan to write a review on Housers in February after one year of investing. returned to my account as a principal payment from a business loan. I wanted to transfer this money to Envestio but no opportunities are available at the moment. According to Envestio support, they have ongoing negotiations with new projects owners, and perhaps, new opportunities will be presented starting from January. This is not exactly what I wanted to hear, so I reinvested the funds in Grupeer’s well-known development project, Promenada (final stage) with a 14% interest rate. A few investments will finalise in the upcoming months and I will have some more chances to diversify. This is my 5th month with Mintos, and my impressions are positive. I was reluctant at first but I began with the Mintos secured loan strategy. It located most of my funds in Mogo cars and mortgatge loans with an 8% net annual return. I gave myself some time to learn how Mintos works and how to use its auto-invest tool properly. 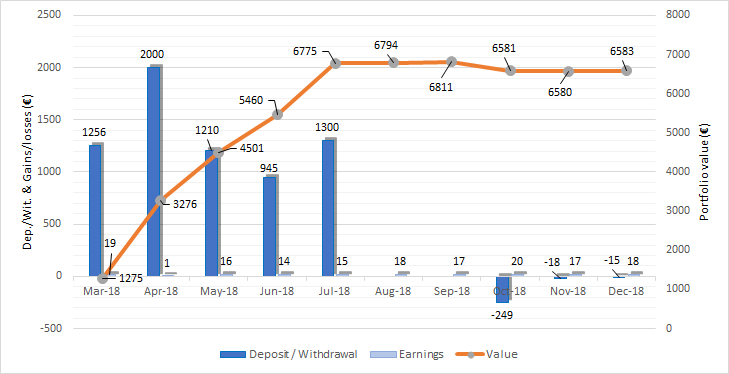 The returns are now at 9.14% and should keep improving as my auto-invest is set to buy short-term loans at 12% with buybacks guarantee. Inger Hotel, Narva, Ida-Virumaa, 20306 with a 12% interest, monthly payments, secured debt and risk class A2. As in Housers, some of the projects only pay interest at the end of the maturity loan (bullet repayment). 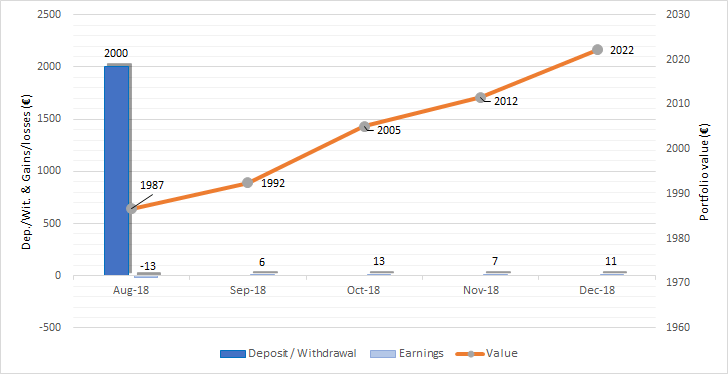 After one year of investing I should get a better approach to the real rate of return. I opened accounts with Mintos and Crowestate at the same time, I am looking forward to see which platform will deliver better results in 1 or 2 years term. And the best crowdfunding performer is… Envestio! 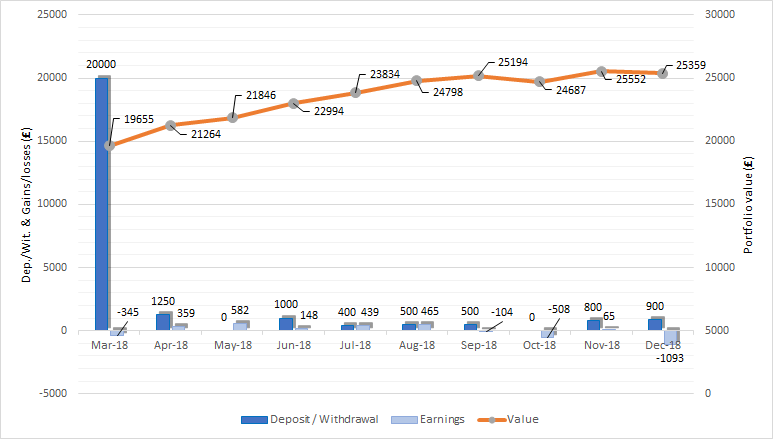 The realised return is already 4.25% since account opening, three month ago (affiliate bonus included from Jørgen at financiallyfree.eu). I expect future opportunities with lower returns. In fact, the last two projects of the year yielded 16% (far off from those 22% previous ones). Still, it is the leader within my crowdlending platforms and I will be tunned closely to see what they have to offer in January, and ready to deposit funds using transferwise. Fast invest is my two months old newborn investment. As its name suggests, it grows fast! It earned 11.09€ (+2.21€ than November), no affiliate commission on this case. Most of my loans are from Denmark and Spain at 13.5% and 15% rates. More funds will pop in soon! 2018 has been an intense year, I changed my job, met new interesting people, bought a cheap second-hand car, moved to a different town, became fully invested, read 13 books, travelled to two countries, and last but not least, started my own blog! I am especially excited with the last one, although, it may be just the fresh feeling of a beginner. A lot to learn and improve in a newly discovered world, that’s just what I love. Thanks for reading my first portfolio update, hope you enjoy reading it as much as I did writing it. I would love to hear from you, so please leave a comment if you liked what you read, thank you. Wish you a successful investing year 2019! Thanks for your comment Luigi, the numbers are impressive because Algotechs, however I don’t recommend them for now.